Diplomacy All other Bajorans in play are INTEGRTY + 2. Your Bajorans may report for duty where present. 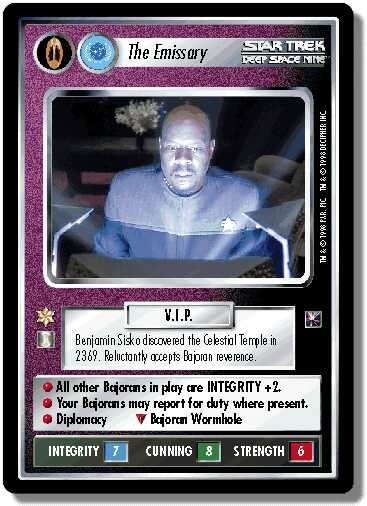 Characteristics: "Reshape the Quadrant"-related cards, affiliation, affiliation, Orb icon , any Sisko, Human species. See affiliation and species, in play, report, Ops. There are 40 entries for The Emissary (ST1E 0 P 52) at the Tradeplace (59 haves and 9 wants). Click here to see all trade list entries for this Promotion card! Also see here for all trade lists with any card fom "Away Team Pack".